July 9th is specially chosen to be as close to the Summer Solstice as possible. New beginnings open with the solstices –the moments when the sun stands still at the turn of each season. 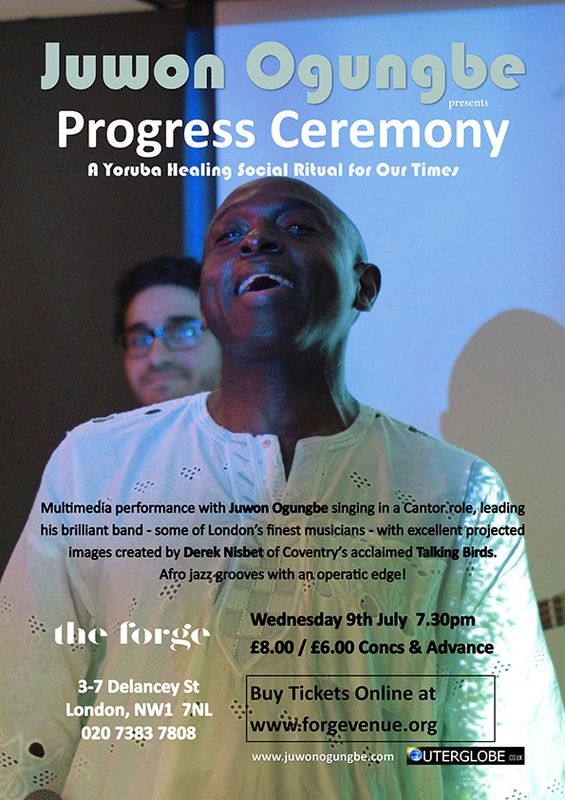 Progress Ceremony is a music driven theatrical narrative, rooted in Yoruba traditions with a great deal to say about our times, offering solutions of healing and renewal. It’s a compelling contemporary “happening”, with inspiring spoken word, exhilarating live Afro jazz grooves with an operatic edge played by some of London’s finest musicians and brilliant projected visuals. 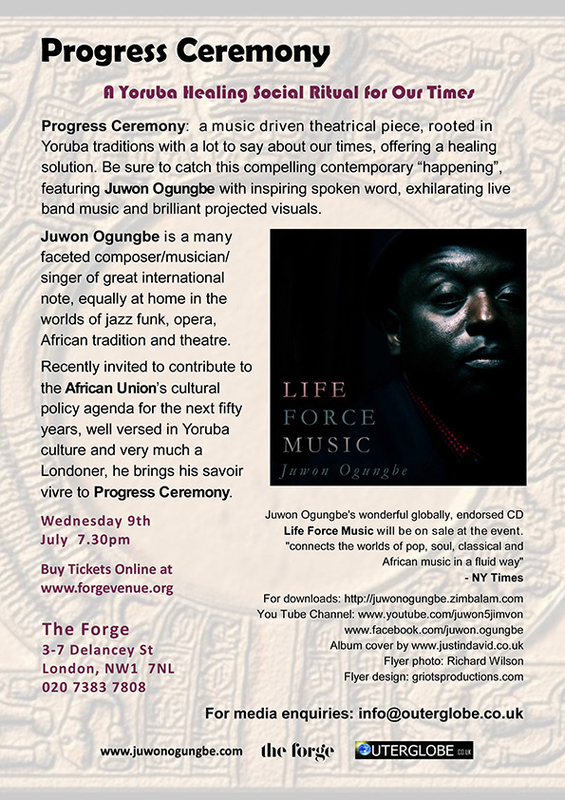 Internationally celebrated musician/composer/performer/ singer Juwon Ogungbe drew from his Yoruba heritage, referencing ancient past, contemporary matters and a glimpse of the future to compose and create “Progress Ceremony”. Above all he was inspired by the multiple strands of invocations, praise and worship, dance and gestures from the Yoruba belief system and a desire to create a piece that can speak across many global cultures, whilst retaining an African worldview. The piece was originally developed with support from the Arts Council of England with interactive feedback from audiences as it progressed. Progress Ceremony began as a short evening’s music with guide images and has grown through a residency at Coventry University where the dance that will eventually become an integral part of future performances was explored, an open rehearsal process and a showcase event, presented to an exceptional packed and extremely enthused house in Brixton earlier this year. The collaboration with multimedia artist Derek Nisbet of Coventry- based Talking Birds has culminated in a sequence of projected images directly related to the music, song and narrative which beautifully illuminates the performance Juwon Ogungbe is a multifaceted creative, equally at home in the many worlds where he is so highly regarded - Jazz funk, Opera, African tradition, theatre ... 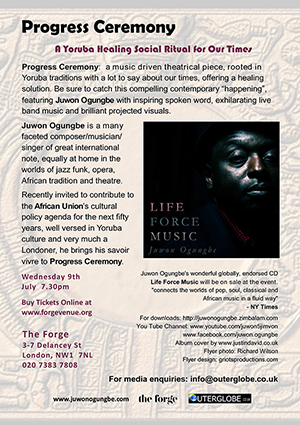 The New York Times welcomed his debut album Life Force Music, which enjoys worldwide airplay, as ‘a flowing bridge between the worlds of pop, soul, classical and African music’ Juwon Ogungbe was recently commissioned to compose the music for the forthcoming BBC Radio 3 Drama production of Wole Soyinka’s “Death and the King’s Horseman”, as an 80th birthday tribute to Nigeria’s Nobel Laureate. He’s composed for the Royal Shakespeare Company, the Southbank Centre and has led creative learning projects in international settings. In 2012 his music-theatre adaptation of Shakespeare’s Merchant of Venice was ecstatically received at the Harare International Arts Festival and he wrote for a large scale community choir for the London 2012 Cultural Olympiad. This year saw the world premiere of “Threshold” - a new show inspired by “The Palm Wine Drinkard”, written by one of Nigeria’s leading exponents of Yoruba culture in literature, Amos Tutuola, at University of Richmond, Virginia as the climax of Juwon’s visiting scholar residency. Life Force Music on Second Generation Records will be on sale at The Forge and is also available online. A vibrant and compassionate musical and visual experience is promised – an essential evening out!